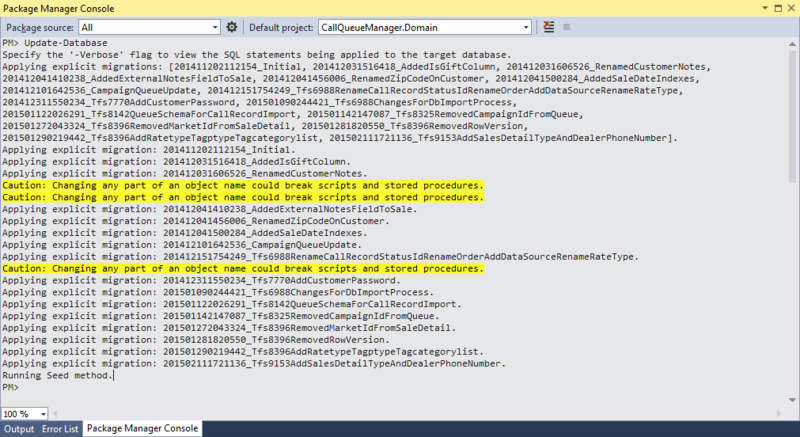 Browsing to to the Azure portal and viewing our Database instances, we’re interested primarily in retrieving an ADO.NET connection string. 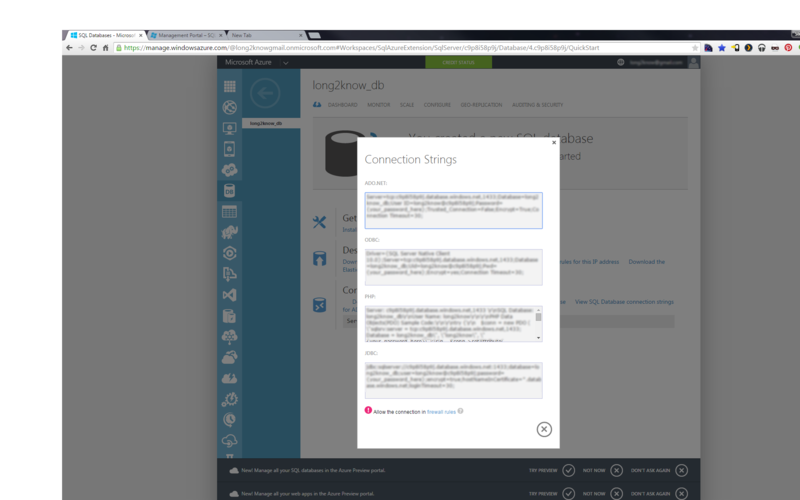 Once we have the connection string, we can modify the web.config in our Web application to utilize this database/instance. After adding this bit of set-up, all that’s really required is to run “Update-Database” from the Package Manager console. In this sense, it’s not terribly different from working with any other network instance of SQL Server. I was pleased that all of my migrations, mostly, ran without issue. I did have a few migrations that referenced other databases that exist on the same server for importing data, but I commented those out for this test. 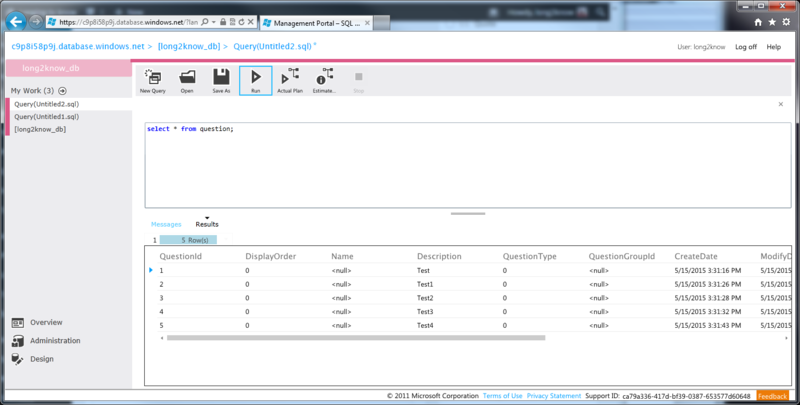 Azure SQL provides some nice browser-based design/querying tools. They do require Silverlight, so I was forced (gah!) to utilize IE to access them. 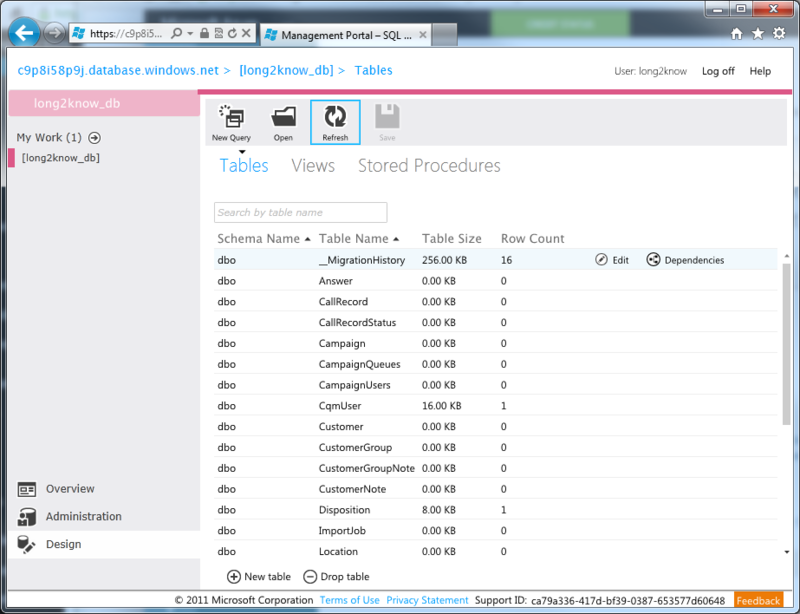 Overall, it’s a similar experience to using SSMS. I can view all of the migrated tables, history, and perform simple queries without little effort. 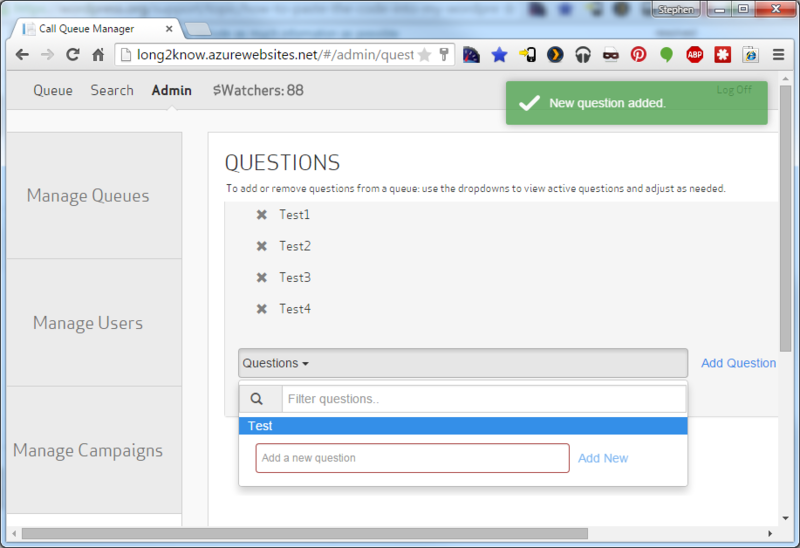 Alluding to my post from yesterday, now it was time to deploy my Entity Framework-based Web App. This was a painless process, but I did run into a few random issues that were configuration related. A route named ‘HelpPage_Default’ is already in the route collection. Route names must be unique. Finally, with those pieces in place, I could now run and play around with my EF based application. It’s a CRUD management app, so I created some dummy entries in the Admin seciton. Keep in mind that I did fake out the login and such for testing purposes. 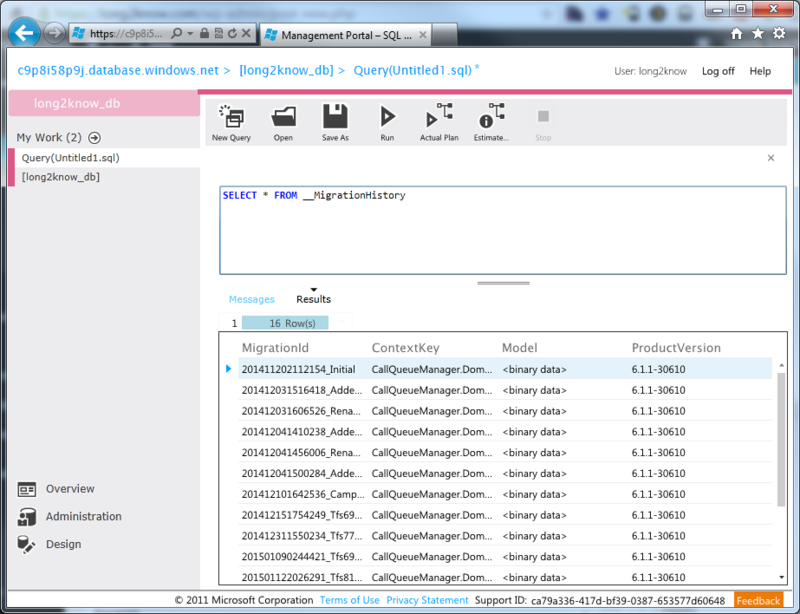 Once I added a bit of data, I could easily go back to the Azure DB management portal and query that data. 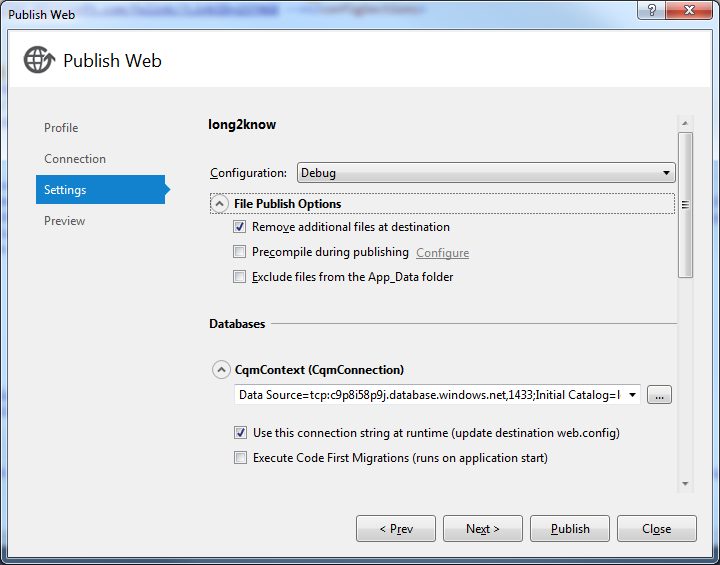 It was nice to see, generally, how straight-forward it is to retrofit an existing ASP.NET application to work as an Azure Web App and to take advantage of Azure SQL. I plan to continue playing around with the Azure (free MSDN) services and potentially use it for hosting demo projects for both internal and external projects. Having this venue available eliminates a lot of hassle that usually comes about when trying to demo WIP to colleagues and others.